OK.. I read this last night and had to post about it. Two Norwegian Dr’s have made a major breakthrough in CFS. They have discovered that a drug (Rituximab) used to treat certain cancers, significantly helped 2 out of 3 cases of CFS, and even completely cured some. While it may not be “the answer” in itself, it will be a major step in uncovering the mystery that is CFS, and will likely lead to better, more targeted research & treatment. The research also suggests that CFS is an autoimmune disease, just like Lupus, MS, and so on. Other researchers (including myself) have already suspected this in the past, due to the often extreme over-reactivity of the immune system in this illness. This evidence also further proves that CFS is not psychological in the least, of which some physicians still believe (obviously uninformed on the latest research in the past few years). This will come as a relief to the millions of sufferers who have been majorly mistreated, disregarded and even ridiculed by mainstream medicine, leaving us with little support, left to fight this on our own. I have posted the original news story below. Please share this post, it is likely one of the most important CFS discoveries to date in the aspect of medicine being on the right path. See more great links on this topic at the end of the article from top CFS specialists etc. Two oncologists in the city of Bergen in Norway have recently discovered a possible treatment for Chronic Fatigue Syndrome. The drug that they administered improved the condition of two out of three of the patients treated. Several patients were healed. The breakthrough, published today in the medical journal PLOS one, can provide answers to CFS-patients concerning what causes the mysterious disease and how it can be treated. “We definitely see an effect. There is hope,” states professor and head of oncology at Haukeland University Hospital, Olav Mella to the TV 2 News. TV 2 has exclusive access to the research paper that came out in the medical journal PLOS one. 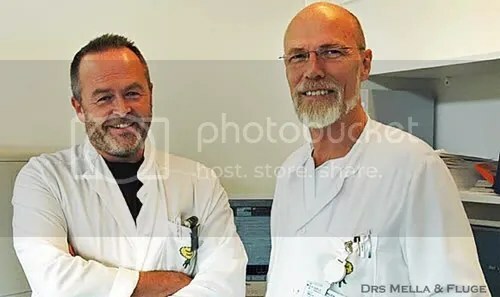 Mella and his colleague, attending MD Øystein Fluge, have completed a double-blind study on 30 Norwegian CFS-patients. The results are sensational. Two out of three of the patients experienced major improvement, while some experienced a full recovery. I addition to providing hope to millions of CFS-patients concerning treatment, the MDs are giving the patients, as a group, new status. The two doctors say the results indicate that CFS is in fact a somatic disease (physical – of the body). “We think that CFS is an autoimmune disease. The immune system has a central role in this,” they say to TV 2 News. The discovery has already attracted international attention. However, the news wasn´t released to the public until today, after the medical journal finally lifted the embargo. Mella and Fluge presented their results as early as in May at a CFS-conference in London. At the conference, reporting restrictions were imposed upon the audience. Following the conference, the doctors have been contacted by several foreign doctors and researchers who attended the London-meeting. The two Norwegians are the first two doctors in the world to have found that the cancer-drug Rituximab has very good effects upon CFS. Each year the disease, which has an unknown etiology, ruins the lives of millions of people worldwide. In Norway alone it is estimated that 15.000 people have CFS. Professor Mella and attending MD Fluge have basically stumbled over what could become one of the biggest breakthroughs in the field of CFS. A patient with Hodgkin’s lymphoma also had the diagnosis CFS. To fight the cancer, the patient was given amongst other treatments, the antibody Rituximab. After a few weeks the patient’s condition regarding CFS-symptoms suddenly improved. “Completely surprisingly, to both us and the patient, the CFS-symptoms were gone after six to eight weeks after the treatment,” says Fluge. Through a so-called double blind study, the doctors have tested the drug which is normally used in cancer treatment on patients who had CFS. There was a total of 30 people in the study. Half of the patients received saline, while the other half received Rituximab. No one knew who received which of these two, including the doctors or the nurses. “The group was split up by the pharmacist who drew lots. The drug and the saline containers were double bagged in red plastic. This was done so no one would see who got what,” says Fluge. In the group that received Rituximab, ten out of 15 had a significant positive effect. Nine of these had what the doctors characterize as a significant improvement. Amongst those who received the placebo, only two had a measureable improvement. Only one of these two experienced what is characterized as a strong improvement. In medical terms these results are considered to be good. Amongst the patients that experienced effects from the drug, the transformations were enormous. They experienced a dramatic improvement in their symptoms. For some patients, the symptoms completely vanished. The study did however show that the duration of the effect varies. Most patients have experienced relapse. Meanwhile, the doctors are now experimenting with continued treatments intended to maintain the effect. These treatments appear to be working. Some might consider administering a cancer drug to CFS patients to be irresponsible. However, Mella and Fluge point out that the CFS patients in some cases are so sick that they are chained to the bed most of the day. Professor Mella is convinced that the possible treatment of CFS patients can have tremendous significance. Currently there is no test to set the CFS diagnoses. Being diagnosed with CFS results from ruling out all other possible diseases. In other words, today there is no cure or treatment for CFS patients in the Norwegian health system. People who get the diagnoses are being offered therapy and courses to learn how to live with the disease. While several private clinics and individuals offer alternative treatments, no one has so far been able to document that their (often very costly treatments) actually have an effect. There have been several theories about what causes CFS. Still the research community has not been able to come to a conclusion. The core of the matter is the question of whether CFS is a physiological or psychological condition. In Norway, the latter explanation has been the prominent one. A Norwegian survey shows that 52 percent of Norwegian health caretakers believe that CFS is a psychological condition. In the last couple of years, theories about CFS being a physiological condition have gained more impact. Now it looks as if the researchers have taken a huge step towards confirming this theory. After having seen the effect which Rituximab produced in the majority of the patients in the study, their theory is that CFS is an autoimmune disease. In short that means that the body’s own immune system attacks the body’s own cells. Other researchers have on previous occasions indicated that CFS is an autoimmune disease. Followign this study with Rituximab in Bergen there is now, for the first time, evidence that supports this theory. “The results show that the immune apparatus plays a central role. We still haven’t found the breaking in point. The fact that the patient has an effect of the drug, might help us. However there is quite a lot of lab work that remains,” says professor Mella. “They will have to wait. First of all there needs to be bigger studies. We definitely see that there is an effect. We will find a treatment, however it might still be years until this can be offered to all patients with this disease,” says Mella. Both Mella and Fluge think that this is the first step on the road to finding a treatment for these patients and also providing the correct diagnosis. “The Drug” – The Rituximab Story – From Beggining to Present. -Comments are also very interesting on this article. -The article & comments are much more important than the video, as it doesn’t relate to the study and doesn’t differentiate ordinary ‘Chronic Fatigue’ from overexertion, from the true illness CFIDS. Interesting-when I 1st was sick in 1986, the one thing the doctors seemed sure about was that I had some auytoimmune disease. The problem they stated was which one. Fibromyalgia mentioned in 1987. CFS was finally diagnosed 10 years later. Autoimmune diseases do occur in my family. That’s really good that your Dr all the way back then suspected autoimmune. Way ahead of their time! Most CFS patients including myself have been through a hell of a time with mistreatment beacuse mainstream medicine has not understood CFS in the least, as most run of the mill blood tests etc come back relatively normal. Fibro & CFS are in the same categorgy (some experts say its the same thing) and a large majority of the time occur together. Hopefully this research will lead to better understanding, testing and treatments in mainstream med, beacuse we sure need the support! I have Fibromyalgia, Lupus and other autoimmune disorders. My fatigue keeps me from brushing my teeth on many days. I believe I have some kind of CFS. My doctor says no. It is so frustrating. More money for research is needed! Yeap, the more complex it gets the more poorly understood it is. Is a sad state of affairs our society where these illnesses have gotten so common & out of control. We weren’t meant to live in such a polluted world, and those of us with more sensitive, poorer detox systems just can’t handle it. I left a previous comment. However, I was wondering if anyone knows if this cancer treatment will help other autoimmune illnesses. Kudos to the doctors who have discovered this! Yeap, it is sometimes used for other autoimmune illnesses like Rehumatoid Arthritis, when other treatments fail. I think it addresses alot of autoimmune issues as they mostly work similarly from the same area of the immune system. I have been entertaining the opinion for a long time that cfs has a multifactorial etiolgy. Autoimmunity had been suspected as a cause for a along time – 1970’s. Genetic predisposition to autoimmunism is an issue that one should bear in mind . Autoimmune attack is not a solitary event .The triggering tends to be repititive giving rise to high concentrations of variety of antibodies which are very difficult to detect This is not the end of the story. Complications set in These complications blur the picture. Some people run in to the conclusion that the complication is the disease. That is how fibromyalgia, emotional disorder and mental illness etc came into the picture.Trying to treat one aspect of the disease or one complication is a big blunder. We must treat the cause but if the cause is immunism or unhelpful genes the challenge becmes very difficult .Rituximab may be way to go but without the basics nothing would work The basics may not be a cure but they would give some relief- at least it would stop the condition becoming worse. In this respect the health of the gut is important because gut is where 80% of the immune cells are lodged. So mild ongoing gut detoxificatiotins as tolerated. [ six very small melas a day , avoid starch and sweets as much as possible ] filtered water. mild physical exercise increaing in intensityvery gradually. one hour of deep meditation [healthy mind is more impotant even than a heathy gut! Clean air [we breathe about 25000 timesa day. if we stop breathing for three minutes we die. That shows how important air is When I say air I mean oxygen and nitrogen together with a little moisture- not the tons of dust you breathe in Fairymeadow. Cheap Zyolte granules -used for cat litter may be an idea. Thank you Dr Wicks! Your wisdom is much appreciated 🙂 I knew autoimmunity had been suspect in the field for some time, but not since the 70s! That’s a long time not to figure out that’s what it largely has to do with. Yes the cause must be found and treated in each case, becaue it is often different. Same end result, different initial trigger. The gut is indeed a huge factor in CFS. Dr Kenny DeMierlier is one of the top in the world on CFS/ME and it is his conclusion that CFS is largely from the gut. He says the worse the gut, the worse the CFS. I can 100% testify to this, as my gut is personally worse functioning that most anyone I’ve met, and so is my CFS. I have personally felt the severity of my condition at different times, and always when the gut is at its worst, like now for instance, is when the entire fatigue and immune dysfunction is also at its worst. Haha!! Yes true clean oxygen is a lot different from the dusty air of FM (or most other developed cities for that matter!). While it is a good news, it also feels like a patch rather than addressing a root of the issue. Allergy can also be considered to be an atoimmune reaction but the culprit is usually an allergen. My theory is poor detoxification due to genetic abnormalities leaves our tissues riddled with toxins, which immune system attempts to rid or wall off thus damaging the surrounding tissue, often times neurological, but gut, liver, brain as well. The issue is still a poor detox, and more research needed in this area rather than only in how we make it stop temporarily, because even if autoimmune process is stopped/slowed down we r still toxic and this is still an issue and a health hazard. True Teah. I agree. The main point of this post is that it’s an extremely significant finding, not so much the drug itself.. but the mechanism of what it does. Lifts the severe fatigue and increases energy production in CFS in such a drastic way. It shows something very significant – that the immune system is over reacting, attacking the body in a way that significantly disables mitochondrial function / ATP production. That along with systemic toxicty, it all contributes to the over all disabling effect. Yes true. The more aspects that can be delt with the better. If the autoimmune attack was gone and that increased significant ATP production, that in ITSELF helps natural detox quite a bit, because it would increase the energy systems & pathways. But yes focus at the moment should be on detox and methylation/glutathione etc until they work something out for the autoimmune aspect.